Whether you focus on 7 wastes or 8 wastes, you can implement the waste walk. The waste walk supports lean management. The term 'waste walk' has been around for decades and is still a really useful tool in any business' quest to drive out wasteful activities and engage staff. Right in front of us, we see wasteful activities taking place; poor layouts, ineffective maintenance, bureaucracy, long winded reports and more. Your business bears every one of these waste items and these ultimately affects the performance and profitability of your business. Please download a Waste Walk template at the bottom of this article. Defects – producing a product incorrectly, or delivering the wrong service to a customer. Overproduction – producing too much, be it a report or a stock of parts. Transport – taking products for a 'walk' or traveling the long way round. Waiting – delays in the business caused by processes not linking together. Inventory – holding inappropriate stocks of parts, materials, or people. Motions – using more effort than needed to perform a task. Inappropriate Processes – using a poor method to conduct an activity. Untapped Human Potential – not encouraging and making the best use of the brains of the people who work with and for you. If you remove Untapped Human Potential then you have the normal 7 wastes that most lean practitioners use. They feel since they aren't in management or engineering, their ideas do not have high value. If they include the workers during the waste walk, who does the work? How do we get production out? This short term thinking causes serious long term issues. The workers work a different shift than the team and can't be there for the waste walk. A 7 wastes muda or 8 wastes walk is a primarily a group activity to identify wasteful practices taking place within a business process. You gather a group together, you agree on a route and then you walk the process. On the way round you look for the common wastes associated with the business, as described above. Depending on the group's size you may choose to have some people focusing on specific wastes types, which can certainly improve the rate of spotting wastes. After you conclude your walk, you then debrief and generate actions from your waste walk. One of the main benefits of a waste walk, it lets you create and execute an action plan. The other benefit, and this really ties in with the last waste listed above (Untapped Human Potential. People deeply learn about your business. Many people understand a business process intellectually, but once they walked the process they can put the process into context. When you see the difficulties associated with a process, or you witness how things work, you get a far better appreciation of the specific micro details within the business. Some organizations use a waste walk to help compound the induction process for new starters, which is an enlightened strategy by most business' standards. 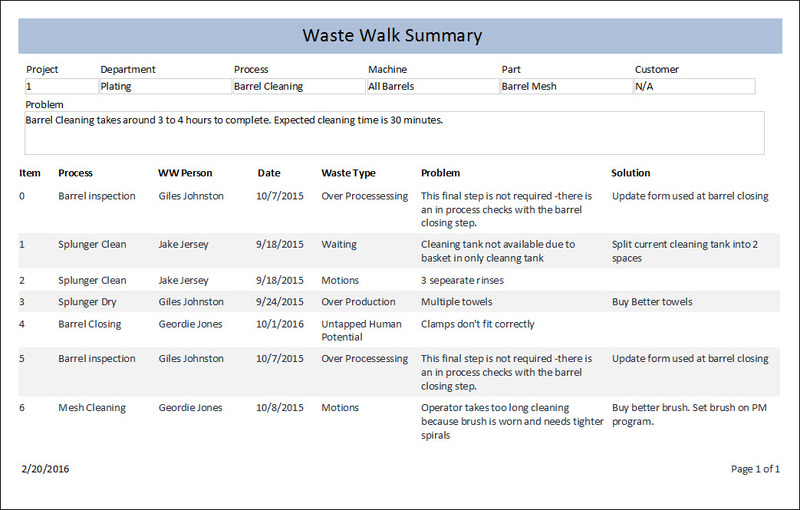 Because you can easily learn and quickly implement waste walking we built this in to our StreamLiner software. 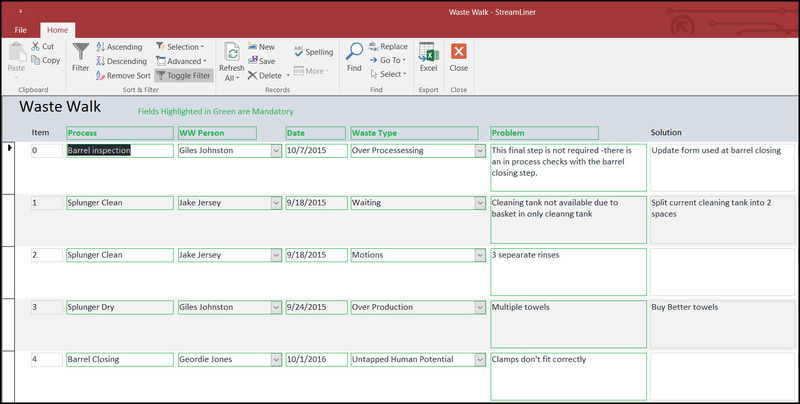 StreamLiner allows you to capture improvement actions from a wide range of process analysis methods and manage the changes thereafter. StreamLiner's real power, it helps busy employees (charged with facilitating continuous improvement) to process all of the opportunities in front of them and manage them in a logical and systematic fashion. StreamLiner aims to help businesses accelerate their continuous improvement projects, simplify the management of change and stop people from getting lost along the way! submit prioritized actions into the main improvement action plan for that project. This tool can also be combined with other tools within the software, such as the meetings management area and the CCC (Concern - Cause - Countermeasure) method. 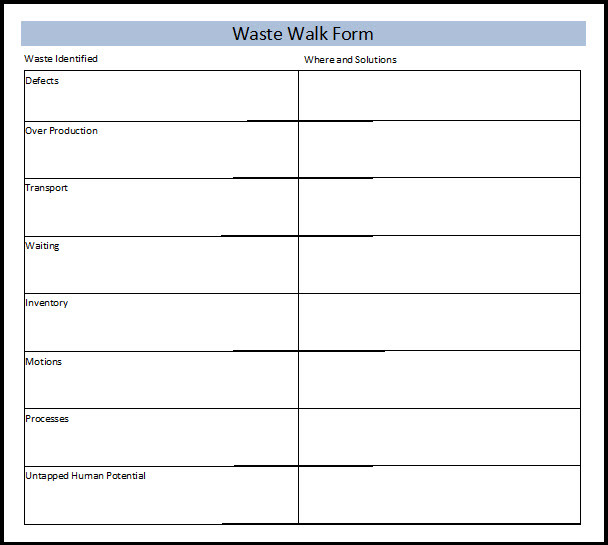 So, to recap, if you want to engage the minds of your team and want to find proven ways to improve the performance of your business then consider using the waste walk approach. Even a handful of opportunities correctly implemented can make a big difference to a business. And, if you want to get an idea of whether this approach really can work, one business that did this with me found a $150,000 annual saving in the first five minutes of one of their walks. I'd say that it is worth the investment in time!